Jerret was born in Shreveport, Louisiana, lived in New Orleans as a child, and moved to Central Louisiana when he was 14. He has called Alexandria home since then. Jerret is a Navy veteran, serving from after he graduated high school in 2006 until 2009. He trained to be a Hospital Corpsman and became a field medic. His duty station was with the 1st Battalion 8th Marines for two years. He later deployed for seven months to the forward operating base in Al Anbar Province, Iraq. Jerret speaks of having a great “feel of community” while in Iraq, helping civilians and young children who were injured and needed medical attention. He received a Commendation medal after his tour in Iraq. 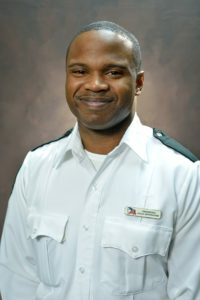 After his service in the Navy, Jerret went on to work at Cabrini Hospital in Alexandria. He spent three years supporting surgical services as a scrub tech and cleaning surgical instruments, then decided to enroll in the next EMT Class at NEMSA. Jerret was hired by Acadian. He went through a rough period of time, both personally and professionally, and there was a separation of employment with Acadian. During that separation he became a Paramedic. Life lessons learned during this time helped mold Jerret into the man he is today. Jerret was then rehired by Acadian. Within six months, he was promoted to Alternate Operations Supervisor/Paramedic Field Supervisor. He took on the challenge of the Critical Care Transport class in October 2015 and now works as a Critical Care Medic on U261. Jerret received nominations from his peers across our seven-parish area for the Paramedic of the Year for Central Louisiana. That is testimony to his professionalism, teamwork, and dedication to what he does as a Paramedic and a PFS. Jerret is a single “hands-on” father to three daughters and a son. He faces daily challenges being a mediator and helping the children balance emotions while traveling between two households. Jerret spends time and is involved in his children’s school activities, but he doesn’t stop there. Church is also a huge part of their lives. The family attends his grandmother’s church, where his father is a deacon and his uncle is the choir leader. Jerret and his children participate in church activities. Jerret is a humble, professional, lead-by-example Paramedic. He sets a benchmark for others to achieve. He is able to communicate and assist others in creating a more enjoyable and positive workplace.